A few months ago I came across a couple of interesting Youtube videos demonstrating the use of simple jigs for accurate hand sawing. 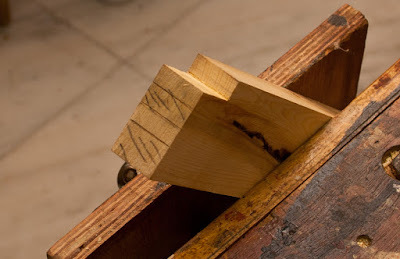 Skilled woodworkers would of course find this to be of no interest but for part-timers like myself the idea of using simple jigs to cut joints accurately is vastly appealing. One of the videos I came across was by a Japanese woodworker called Mirai Sugita, who has devised a few exceedingly simple but effective jigs for cutting tenons and similar joints. After watching his videos I made a couple of jigs like Sugita's using some magnetic strip bought from amazon.in. The problem was the saw. 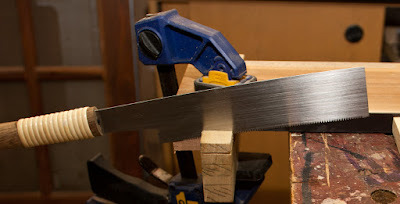 All saws normally have what is known as a "set"; the teeth angle out slightly to prevent the saw blade from binding in the wood while it is cutting. This set causes a normal saw to cut into the sides of a jig. The solution is a flush cut saw, one that has absolutely no set in its teeth. This kind of saw will slide against a jig without cutting into it. Flush cut saws are common in the West. They are mostly used for cutting off protuberances such as dowel ends. Unfortunately they are not available anywhere in India. I ordered a couple of variants from Japan (toolsfromjapan.com)and they arrived a few days ago. The Razorsaw Kugihiki is a small flush cutting saw (with a seven inch blade), suitable for trimming dowels, protruding tenons and similar cuts. It has a flexible blade. It is said to be suitable for guide block controlled cuts but I found it to be too flimsy for cutting joints like small tenons. Yet this is a saw that I am certain to keep close at hand all the time for trimming jobs. Its blades can be re-sharpened which suggests it could be a tool for a lifetime. I would not fret if it did not last that long given that it is quite frail and sharpening the teeth of Japanese saws is no mean feat. The Mitsukawa Saw is certainly prettier of the two with a kind of rustic charm. I immediately found this saw was just the thing for cutting joints with jigs. This saw is one of the many kinds made by a relatively young Japanese saw smith called Daizo Mitsukawa (born 1961), who is based in Miki City, Hyogo Province. He also makes high end saws besides the many good quality but affordable saws like this Kugihiki, which are cut by machines. This saw too can be re-sharpened but that is in theory only. The fine teeth pattern of the saw is guaranteed to intimidate all but the extremely foolish or brave. I therefore plan to use it sparingly and carefully for small joinery only. Saws like this one are meant to be used with some care as their blades are extremely thin and can kink, bend or snap if forced. These saws require a gentle rhythmic movement to cut. Over the last few months I have begun to sense when a Japanese saw is cutting without straining, at ease and in harmony. That duration is a delight. Have you given any thoughts of conducting a "Master Class" for all us beginners in this rather treacherous and sometimes torturous journey. Thanks, Umaji. You hardly sound like a beginner! Besides, I don't think woodworking classes would have too many takers anywhere in India. Indranil, suppose you were to run such a class, how many people would you need, and how long would the course be. Could you try making videos and starting a youtube channel. This will have a greater impact at a fraction of the cost. That is a very good idea. I have been toying with the idea of making videos but lack the skill and software to edit the videos. I have an old-ish video camera but the resolution is tolerable though it is not HD quality. Let's say 6 people, 3 days, in Bangalore, and 4 hours a day. How much do you think this would cost per person. Can you put a figure to this. what kind of equipment would you lug around the country? Umaji, the math is simple: my cost for 3 days (airfare 10k, hotel 15k, transport 5k, excess baggage about 5k and daily expenses 6k) would be 41k divided by 6 would mean about 7k per head. Plus one has to find a place to do the workshop. Instead of all this, I suggest you make a trip to Greater Noida, which is a most salubrious place. I would be happy to interact and do some hand tools woodworking together. Best wishes. how was your experience with the shipping and customs? Excellent! It took five days after being shipped from Japan and no customs duty as the total was below Rs 5,000.